Why are e-vignette and toll implemented in Bulgaria? As of 2019 e-vignette and toll will be introduced in Bulgaria as a modern way of charging for the use of the national payed road network. In this way the necessary financial resource is being generated, that is further invested for sustainable development of existing and new roads, including road safety. The road charge collection system is based on state of the art technologies which allow suitable ways of payment and control without hindering the free movement of the vehicles. The system applies a fair charging model based on European directives. What is the e-vignette and the electronic toll collection system? As of January 1, 2019, e-vignette will be introduced in Bulgaria for the use of the national payed road network. The prices of the e-vignettes will remain the same for all vehicle types. Starting from 2019 also a weekend vignette will be introduced for light vehicles. Since the entering into force of the e-vignette there is no longer need to put a sticker on the windscreen of the vehicle. During a roadside check by the control authorities the owners and users of the vehicles shall not be obliged to present a document proving the purchase of e-vignette. For heavy goods vehicles with total technically permissible maximum weight over 3,5 tons the vignettes will be valid till 15 August 2019. As of 16 August 2019, toll charging will be introduced for them. In order to perform its activity on toll collection, the Road Infrastructure Agency will operate an Electronic toll collection system. The system is combination of technical means and procedures for sale, validation and control of the regulated use of the road network. How long are paper vignettes valid for? Paper vignettes, which expire in 2019, will remain valid until their expiry date. The vignette sticker must remain on the windscreen until it is no longer valid, so that it can be checked by enforcement bodies. Which roads are subject to e-vignette charging in Bulgaria? You can see a map of the vignette charged road sections here. What are the consequences of driving without vignette? If you have not paid vignette charge for the use of the paid road network, you are an infringer and are subject to penalty. Infringement is determined through the Electronic system and through the stationary and mobile cameras of the National Toll Administration located on the road. Control of the payment of vignette charge will be performed by the authorities of the Ministry of Interior as well as the National Customs Agency in the cases where the vehicle leaves the territory of Bulgaria through the border crossing points. Around 300 stationary cameras and 105 vehicle-mounted cameras will be functioning on the roads of Bulgaria, which will control, in a twenty-four-hour regime, the payment of the respective road charge – e-vignette, by licence plate recognisition of the vehicle and verification in the system. Which are the control authorities that will monitor for e-vignettes? Control of the payment of vignette fee will be performed by the following authorities - the National Toll Administration, the Ministry of Interior, as well as the Customs Agency in the cases where the vehicle leaves the territory of Bulgaria through the border crossing points. How can I pay the compensatory charge or fine? • during roadside check by the control authorities of the National Toll Administration. It can be paid only by card on POS terminals which the mobile teams of the so called toll control will be equipped with. • at the border crossing points payment in cash will also be possible considering the fact that the respective vehicle may leave the country only after its payment. The user of the tolled road network has the possibility to pay the compensatory charge by bank transfer, as well in the points of sale – in cash or by card. During on-the-road inspection by the officials of the Ministry of Interior compensatory charge MAY NOT be paid on spot. A fine may be paid by bank transfer. HOW LONG DOES IT TAKE FOR A BANK TRANSFER, CARD PAYMENT OR CASH PAYMENT TO GO THROUGH? When buying an e-vignette via bank transfer, technological time is needed in order for the payment to go through, as with all bank transfers. Therefore, drivers who have chosen the option of paying for their e-vignette via bank transfer, need to provide for at least three business days before the trip. This period is valid only if the PAY number has been correctly entered in the payment order and the correct amount, as calculated in the PAY number, has been deposited. Only the 13-digit PAY code generated upon the e-vignette registration should be entered in the “Details of payment” field in the payment order (no spaces or any other information). For each generated PAY code, a separate payment order is prepared. Please note that payment orders are processed automatically and therefore all information must be filled out correctly. In the Recipient field, you need to write АПИ or Агенция „Пътна инфраструктура“ (this is the Road Infrastructure Agency). Credit/debit card payments or cash payments show up in the system within five minutes. Those who have purchased an e-vignette can check whether it is valid by using the Vignette Check button on the bgtoll.bg website. What happens if I enter incorrect data about the vehicle’s number plate, e-mail or validity term of an e-vignette? When purchasing an e-vignette, the owner or the user of the vehicle is responsible for entering the correct information. Pursuant to Art. 5, para. 3 of the Ordinance on the terms, conditions and rules for the development and operation of a mixed system for charging different categories of road vehicles based on time and distance travelled. The Road Infrastructure Agency and the National Toll Management shall not be held liable for any incorrectly entered data. When purchasing an e-vignette from the www.bgtoll.bg website, through a self-service terminal and the mobile application, you have to go through one final step of checking the data you have entered. SHOULD I USE CYRILLIC OR LATIN LETTERS FOR THE VEHICLE REGISTRATION PLATE? You can either use Cyrillic or Latin symbols when entering the vehicle registration plate number on the website and the mobile application for the purchase of an e-vignette – symbols should correspond to those on the registration plate. Only letters and digits should be entered. Do not enter dashes, dots or spaces if the registration plate contains any. All letters must be capital. The number zero (“0”) and the letter “O” are not interchangeable. You have to use “0” (zero) for digits and “O” for letters. Where can I buy e-vignette? How can I pay for e-vignette? When purchasing online at site www.web.bgtoll.bg or through mobile application payment by card is possible. Cash payment is possible only when purchasing e-vignette at the cash desk in the points of sale and in the offices of the Road Infrastructure Agency. In the designated points of sale payment is possible also by card, including fuel card. Payment of e-vignette can also be made by bank transfer. For this purpose, it is necessary first to buy it on www.bultoll.bg , and when executing the bank transfer in the box “payment details” the identification number of the generated e-vignette to be indicated. How can I check whether the e-vignette that I have payed is valid? When purchasing an e-vignette online at the site www.web.bgtoll.bg and by mobile application, on the final step a confirmation for successful purchase is generated on the screen. If you have indicated an e-mail address, the same information will be sent also to your electronic mailbox. 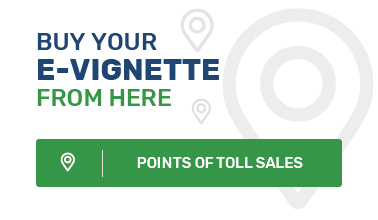 When purchasing an e-vignette at a point of sale or in regional office of the Road Infrastructure Agency, as well as on self-service terminal, a receipt will be generated for the purchased e-vignette. This receipt, as well as the confirmation for successful purchase does not need to serve as a proof and you are not obliged to present them to the officials performing control over road charge payment obligation. Verification of the validity of the purchased e-vignette can be made at any time on the site www.web.bgtoll.bg and on the self-service terminal. What happens if I enter wrong data about the licence plate number of the vehicle, e-mail or validity term of an e-vignette? When purchasing an e-vignette the person entering the data is responsible for entering the correct information. When purchasing online at the website www.web.bgtoll.bg, self-service terminal or mobile application, the system requires at the final step verification of the entered data. We encourage users who buy e-vignette to check carefully and verify the information they have entered before confirmation of the final payment. Road Infrastructure Agency and National Toll Administration are not liable for wrongly entered information. May I receive an invoice for the bought e-vignette? Pursuant to the Value Added Tax Act, road charges (e-vignette and toll) represent state charge that is not subject to VAT. The tariffs for e-vignette and toll are the same, irrespective of the way of purchase – from the internet site www.web.bgtoll.bg, mobile application, self-service terminal or at cash desk at the points of sale and the regional offices of RIA.